Is Consolidated Edison, Inc. (NYSE:ED) a good equity to bet on right now? We like to check what the smart money thinks first before doing extensive research. Although there have been several high profile failed hedge fund picks, the consensus picks among hedge fund investors have historically outperformed the market after adjusting for known risk attributes. It’s not surprising given that hedge funds have access to better information and more resources to find the latest market-moving information. Hedge funds collectively bailed on Consolidated Edison, Inc. (NYSE:ED) in Q2, as ownership of the stock sank by 33%. Being a dividend aristocrat wasn’t enough to compel funds like Ray Dalio’s Bridgewater Associates and Steve Cohen’s Point72 Asset Management, from selling off their shares. Nonetheless, Consolidated Edison is one of the 25 Best Dividend Stocks for Retirement in our humble opinion, sporting a 3.76% annual dividend yield and 44-year run of paying out dividends. In the financial world there are tons of indicators investors have at their disposal to analyze their holdings. A couple of the less known indicators are hedge fund and insider trading moves. We have shown that, historically, those who follow the best picks of the elite hedge fund managers can beat the market by a superb amount (see the details here). What does the smart money think about Consolidated Edison, Inc. (NYSE:ED)? Heading into the fourth quarter of 2018, a total of 14 of the hedge funds tracked by Insider Monkey were bullish on this stock, a 33% slide from the previous quarter. 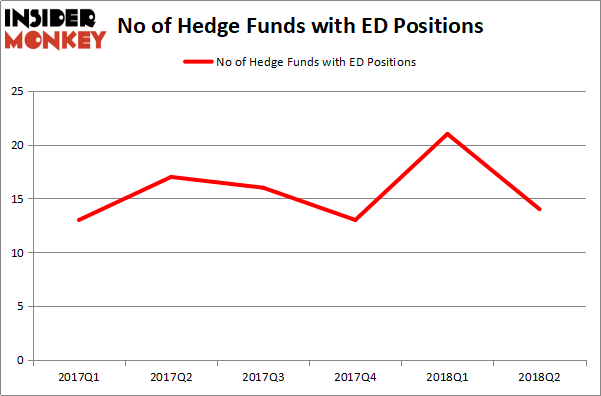 The graph below displays the number of hedge funds with bullish positions in ED over the last 6 quarters. So, let’s review which hedge funds were among the top holders of the stock and which hedge funds were making big moves. Among these funds, AQR Capital Management held the most valuable stake in Consolidated Edison, Inc. (NYSE:ED), which was worth $727.7 million at the end of the second quarter. On the second spot was Renaissance Technologies which amassed $221.2 million worth of shares. 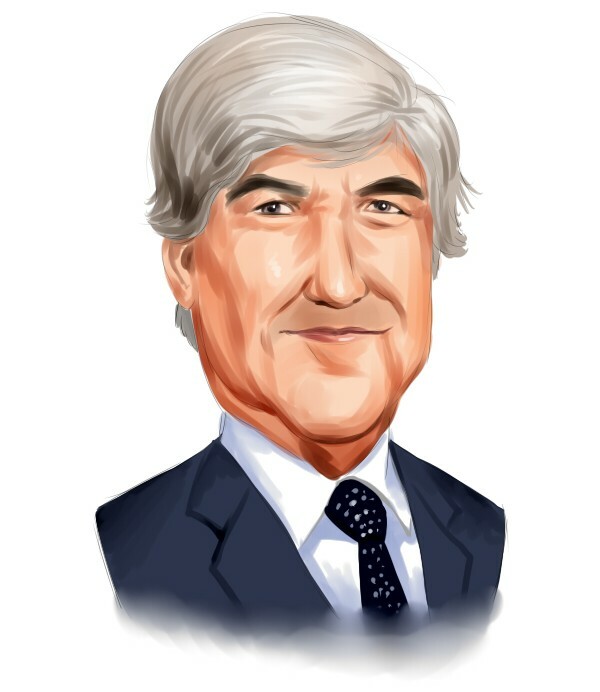 Moreover, Lucas Capital Management, GLG Partners, and Bruce Kovner’s Caxton Associates LP were also bullish on Consolidated Edison, Inc. (NYSE:ED), allocating a large percentage of their portfolios to this stock. Seeing as Consolidated Edison, Inc. (NYSE:ED) has faced a decline in interest from the aggregate hedge fund industry, we can see that there were a few hedgies that elected to cut their full holdings heading into Q3. It’s worth mentioning that Clint Carlson’s Carlson Capital dropped the largest stake of the 700 funds tracked by Insider Monkey, comprising an estimated $26.9 million in stock. Peter Rathjens, Bruce Clarke and John Campbell’s fund, Arrowstreet Capital, also sold off its stock, about $2 million worth. These bearish behaviors are intriguing to say the least, as aggregate hedge fund interest was cut by 7 funds heading into Q3. Let’s also examine hedge fund activity in other stocks – not necessarily in the same industry as Consolidated Edison, Inc. (NYSE:ED) but similarly valued. We will take a look at Red Hat, Inc. (NYSE:RHT), Hilton Worldwide Holdings Inc (NYSE:HLT), AvalonBay Communities Inc (NYSE:AVB), and POSCO (ADR) (NYSE:PKX). All of these stocks’ market caps resemble ED’s market cap. As you can see these stocks had an average of 31 hedge funds with bullish positions and the average amount invested in these stocks was $1.44 billion. That figure was $995 million in ED’s case. Hilton Worldwide Holdings Inc (NYSE:HLT) is the most popular stock in this table. On the other hand POSCO (ADR) (NYSE:PKX) is the least popular one with only 14 bullish hedge fund positions. Compared to these stocks Consolidated Edison, Inc. (NYSE:ED) is even less popular than PKX. Considering that hedge funds aren’t fond of this stock in relation to other companies analyzed in this article, it may be a good idea to analyze it in detail and understand why the smart money isn’t behind this stock, despite its nice dividend history.